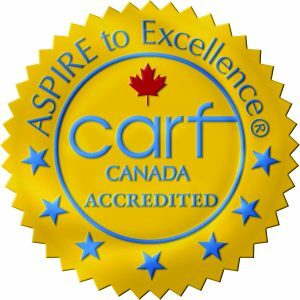 We are proud to announce that as of January 1, 2017, Round Lake Treatment Centre has been awarded a three year accreditation with CARF International! Round Lake Treatment Centre has been internationally accredited by CARF for the past 20 years. The 3-year accreditation represents the highest level of accreditation that can be awarded to an organization’s substantial conformance to the standards established by CARF. An organization receiving a three-year accreditation outcome has put itself through a rigorous peer review process and has demonstrated to a team of surveyors during an on-site visit that its programs and services are of the highest quality, measurable, and accountable. Providers that meet CARF standards have demonstrated a commitment to being among the best available. CARF is an independent, international, not-for-profit accrediting body whose mission is to promote the quality, value, and optimal outcomes of service through a consultative accreditation process that centers on enhancing the lives of the persons served. Founded in 1966 as the Commission on Accreditation of Rehabilitation Facilities, and now known as CARF, the accrediting body establishes consumer- focused standards to help organizations measure and improve the quality of their programs and services.